Since 1942, Guide Dogs for the Blind, Inc. (GDB) has been providing highly trained guide dogs for people with visual impairments throughout the United States and Canada all at no cost to the partner. GDB has never received any government funding and it continues to rely on the generosity of many dedicated volunteers, such as puppy raisers, and financial supporters in order to accomplish its’ mission to the visually impaired. 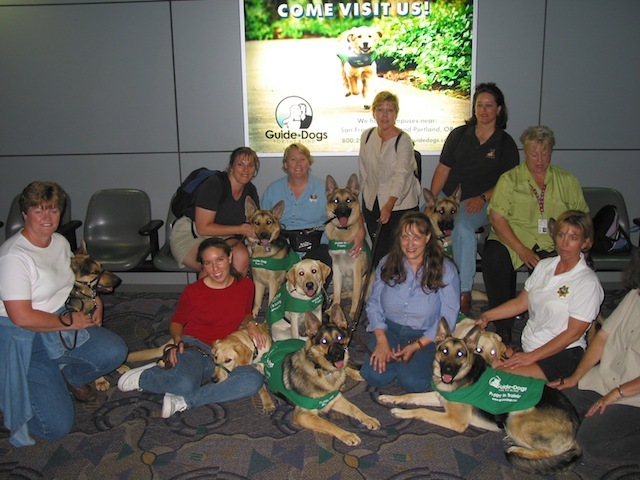 The Contra Costa East Guide Dog Raisers is one of many puppy raising groups serving GDB. Our volunteer puppy raisers are responsible for teaching the puppies basic obedience, for socializing the puppies in all types of environments (including public transportation, malls, churches, grocery stores, restaurants, and places of employment), and for loving and nurturing the puppies. Puppy raisers are a crucial component to the future success of the puppy as a working guide dog. The Contra Costa East Guide Dog Raiser Group functions financially independently from our parent organization, GDB. Our puppy raisers are responsible for all costs associated with raising their puppy, except for some veterinary expenses. We supply our puppy raisers with certain equipment, such as ex-pens, crates, and long lines, to help defray the costs associated with raising their puppies for GDB. We fund our group expenses through grants, by volunteering at income generating community events, and by the generous donations of the local Lion’s Club. If you would like to make a financial contribution to our puppy raising group, you may do so by contacting Mark at mark@guidedogpuppies.com. Your donation to our puppy group, through our parent organization, Guide Dogs for the Blind, is tax exempt under the provisions of section 501 (c)(3) of the Internal Revenue Code. The tax ID number for Guide Dogs for the Blind is 94-1196195. One hundred percent of your donation will go directly towards expenses associated with raising and training our puppies for Guide Dogs for the Blind. You will have the satisfaction of knowing that your donation is significantly contributing to a very worthy cause. We sincerely appreciate the tremendous support we receive from our community and from our generous donors to help in our efforts to partner in the mission for Guide Dogs for the Blind.